Oh, you Percy Jackson fans are so lucky. 2018 is your year. 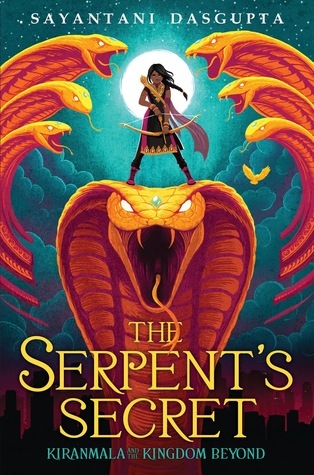 Because 2018 is the year that The Serpent's Secret (Kiranmala and the Kingdom Beyond #1) by Sayantani DasGupta came out, opening a brilliant new mythology series. When Kiranmala's parents disappear on the morning of the 12th birthday (which also happens to be Halloween), the New Jersey tween doesn't think too much of it. Until a giant rakkhosh demon shows up at her house, thirsty for blood, and two handsome Indian princes arrive, announcing that they're here to save her. Kiran doesn't need saving - she handles the demon pretty well on her own, though it's not pretty - but she does need answers. What has happened to her parents? And how can she save them? Kiran discovers that there is truth behind the magical stories her parents used to tell her. She is an Indian princess, she's been living under a magical spell that broke on her 12th birthday, and she'll have to journey through other dimensions, meeting all kinds of fabulous and horrifying creatures to try to get her parents back. This series opener is a great readalike for Percy Jackson because it mixes action-packed adventure with a strong dose of humor. Although there are lots of fantasy-adventure-mythology series that have come out since Percy Jackson became so popular, this one stands out because I think the tone is very similar. Kiran is a smart, strong heroine who is up to the task of saving the world and young readers who enjoy fantasy adventure will clamor for the next books in the series. I listened to the audiobook, which is read by the author. She reads with a ton of energy and singsong voices for the monsters that make the most out of the punny and slapstick humor. If sometimes her voice is a bit unpolished, it's made up for by the fact that I know she's pronouncing everything write and that she's an #ownvoices narrator telling her story. And for an author narrating, it's really very decent. Of course, hand this book to fans of Rick Riordan's many mythology series (Percy Jackson, Magnus Chase, etc.). Readers interested in Indian mythology will also want to check out The Savage Fortress by Sarwat Chadda (Scholastic, 2013), although be warned that the only books one and two of the Ash Mistry series were published in the US. The Serpent's Secret by Sayantani DasGupta. Grades 4-8. Scholastic, 2018. 368 pages. Audiobook from Scholastic Audio. 8 hrs. 14 minutes. Read by Sayantani DasGupta. Review copy provided by my local library.